The New York Times bestselling and extraordinary true story of the critical events leading up to and following the assassination of President John F. Kennedy, as told by the Secret Service agents who were firsthand witnesses to one of America’s greatest tragedies. The Secret Service. An elite team of men who share a single mission: to protect the president of the United States. On November 22, 1963, these men failed—and a country would never be the same. Now, for the first time, a member of JFK’s Secret Service detail reveals the inside story of the assassination, the weeks and days that led to it and its heartrending aftermath. This extraordinary book is a moving, intimate portrait of dedication, courage, and loss. Drawing on the memories of his fellow agents, Jerry Blaine captures the energetic, crowd-loving young president, who banned agents from his car and often plunged into raucous crowds with little warning. He describes the careful planning that went into JFK’s Texas swing, the worries and concerns that agents, working long hours with little food or rest, had during the trip. And he describes the intensely private first lady making her first-ever political appearance with her husband, just months after losing a newborn baby. Here are vivid scenes that could come only from inside the Kennedy detail: JFK’s last words to his tearful son when he left Washington for the last time; how a sudden change of weather led to the choice of the open-air convertible limousine that day; Mrs. Kennedy standing blood-soaked outside a Dallas hospital room; the sudden interruption of six-year-old Caroline’s long-anticipated sleepover with a friend at home; the exhausted team of agents immediately reacting to the president’s death with a shift to LBJ and other key governmental figures; the agents’ dismay at Jackie’s decision to walk openly from the White House to St. Matthew’s Cathedral at the state funeral. Most of all, this is a look into the lives of men who devoted their entire beings to protecting the presidential family: the stress of the secrecy they kept, the emotional bonds that developed, the terrible impact on agents’ psyches and families, and their astonishment at the country’s obsession with far-fetched conspiracy theories and finger-pointing. 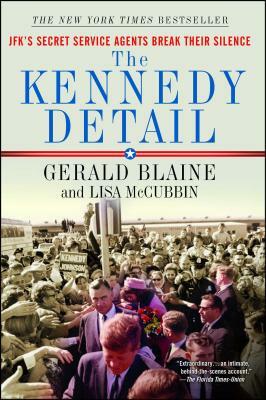 A book fifty years in coming, The Kennedy Detail is a portrait of incredible camaraderie and incredible heartbreak—a true, must-read story of heroism in its most complex and human form. As a Special Agent of the Secret Service on the White House Detail, Gerald “Jerry” Blaine had the privilege of serving three U.S. presidents during one of the most tumultuous times in American history. After resigning from the Secret Service following John F. Kennedy’s assassination, Blaine embarked on a career path with IBM Corporation and became a leading expert in high-level security, lecturing worldwide on the use of computers in Criminal Justice and Intelligence. In 1990, Blaine retired from IBM and joined ARCO International Oil and Gas in Dallas, Texas as the Director of International Security, Government Relations and Foreign Affairs. After retiring from ARCO in 1999 Blaine spent four years with Hill & Associates, an Asian-based consulting company, as a Senior Consultant, and finally retired from the corporate world in 2003. He now lives in in Grand Junction, Colorado with Joyce, his wife of more than fifty years. The couple has two children and four grandchildren.